PHUKET: The annual Red Cross Fair, underway at Saphan Hin, on the outskirts of Phuket Town, was officially opened by Phuket Governor Chockchai Dejamornthan last night (Dec 30). Among the guests of honour at the very popular annual event were Raweewan Dejamornthan, who as the Governor’s wife is the head of the Phuket Chapter of the Red Cross in Thailand, and Phuket Vice Governors Teera Anantaseriwidhya and Siwaporn Chuasawad. The Red Cross Fair began Thursday (Dec 29) and will conclude on Jan 8. 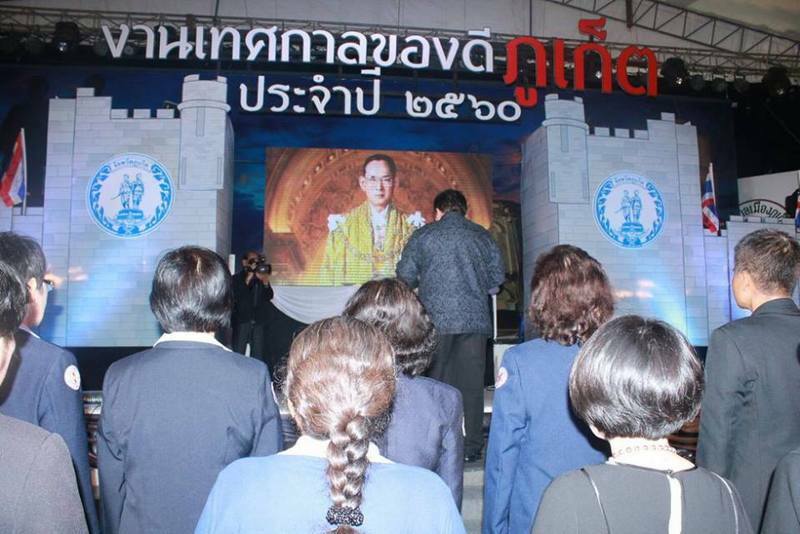 Governor Chockchai in officiating the formal opening of the fair called on all people in Phuket to honour, remember and respect the late King Bhumibol Adulyadej, who passed away on Oct 13. 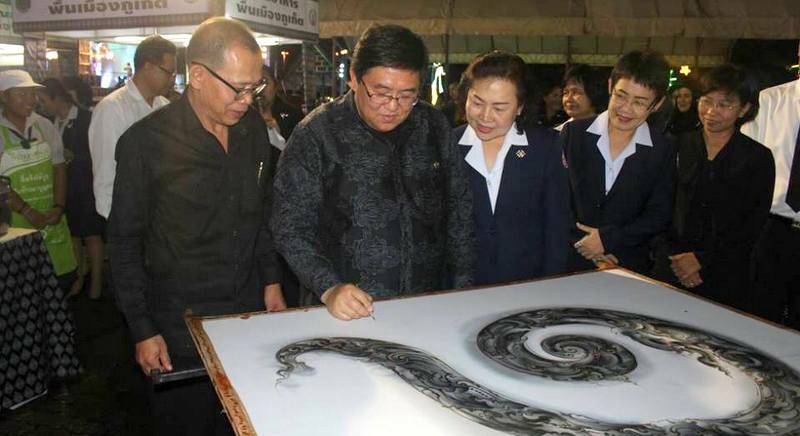 As part of the the proceedings, Gov Chockchai signed a work of art in the form the Thai numeral 9 to honour the late King Bhumibol, who as Rama IX was the Ninth Monarch of the Chakri Dynasty. Gov Chockchai also led those present in singing Sansoen Phra Barami to honour King Bhumibol. However, the traditional role of the Red Cross Fair, which is held in every province in the country at different times throughout the year, is to raise funds for their charity work, which includes providing emergency relief to victims of floods and other disasters and to run their continual blood-drive campaigns to help people in critical life-endangering conditions, including many road-accident victims in Phuket. In addition to the many regular fun fair stalls, this year the fair features an exhibition highlighting the many great achievements of the late King Bhumibol. “There will also be food contests to highlight the local food of Phuket and many market fun fair booths,” Mr Thawornwat said. Each night at the fair many stars perform live on stage, including celebrities from Bangkok, drawing many visitors to the fair. The renowned lucky draw prizes, the main means of fund-raising at the annual fair, this year are expected to help drive the fund-raising efforts. This year the top prizes are a Toyota Vios and Hilux Revo pickup truck. 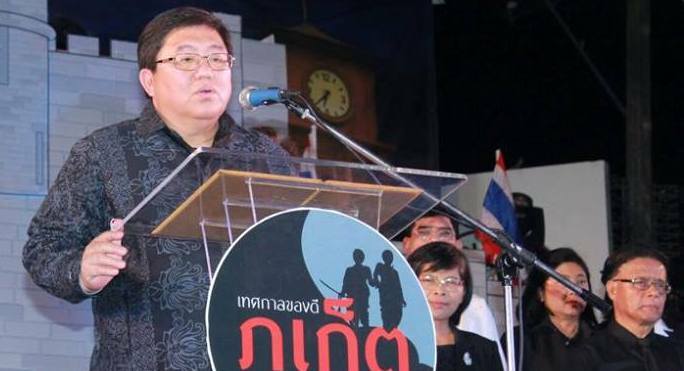 “We also have five motorbikes and 10 bars of gold each worth just under B20,000 as main luck draw prizes,” Phuket Regional Blood Centre (PRBC) chief Pornthip Ratchak told The Phuket News today. “Of course we have many of our usual great prizes up for grabs, including refrigerators, microwave ovens, TVs, fans and bicycles – and 11 more motorbikes up to be won in separate lucky draws,” she added.